As if the lifestyles of the rich and famous don’t make you sick enough, it’s now been revealed how much they get paid for their Instagram posts. Wait,.. what?! They get paid for them? Seriously? There was me thinking Kim Kardashian genuinely wanted us to all know about an amazing product she’s come across and always uses… *rolls eyes*. 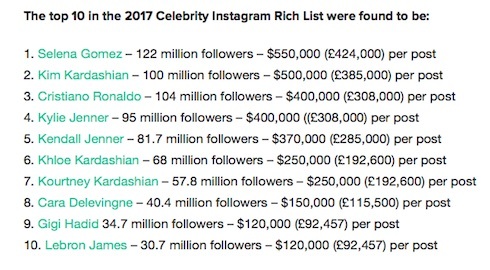 Well anyway, the first ever Instagram ‘rich list’ has been compiled and the top earners have been revealed. Researchers from HooperHQ published the list after analysing 1.2 million posts scheduled through the social media platform, according to the Huffington Post. Bieber’s ex Selena Gomez is top, who reportedly earns £424,000 per post while Mrs Wrest, a.k.a Kim Kardashian comes in at number two, reportedly earning £385,000 per post. If anyone wants to sponsor me – I can make a £6 pair of Primark leggings look bloody awesome – especially whilst posing on my sofa hungover surrounded by cats! In stark contrast though, the British blogger Zoella reportedly makes £10,800 per post – I’d happily take that though! The research also revealed that only a fifth of sponsored posts were made clear that the user had been paid to post content – another way to mislead people, especially the young and impressionable! It’s reported that on average, one in 20 Instagram users now monetise their posts and sponsored content has increased by more than a third on the social media platform since 2015. Instagram said they do not comment on third party studies, so wouldn’t confirm whether the figures were accurate. Understanding where sponsorships or endorsement deals do or don’t exist is a complex challenge for the industry – online and off – and we are exploring what works best for our community. We encourage everyone in the Instagram community to follow local industry guidelines around transparency with any sponsored content. Last month Instagram said they were trialling a new tool to bring transparency to branded content – via a new “paid partnership with” tag on posts and stories. The tool allows a creator to tag business partner they are working with and provides access to insights for the content created as part of this partnership. We are initially working with a few launch partners with the goal to learn and gather feedback – this is a first step and we hope to roll it out globally to brands and creators in the coming months. Another Happy #AirMaxDay from my Princess and I. Hey @nike Zhuri said turn her shoes into Air Maxes. ????? 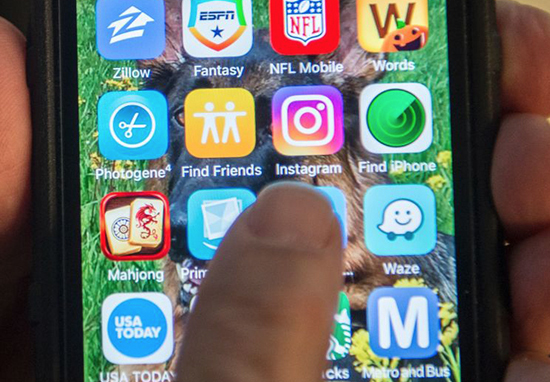 The co-founder of HopperHQ.com, Mike Bandar, said that Instagram was an ‘incredibly effective tool for brands’. In the last couple of years influencers and celebrities have really caught on to the fact that endorsing brands on Instagram pays off and as you can see from our rich lists, there is a serious amount of money to be made. Mr Bandar also said that is was important for users on Instagram to be aware that their favourite celebrities are being paid to promote products and services. The recent introduction of the ‘paid partnership’ label will go some way to ensuring there’s more transparency on the platform. 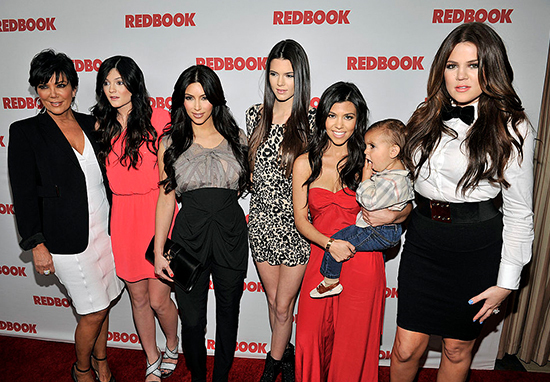 Selena Gomez, Kim Kardashian, Cristiano Ronaldo, Kylie Jenner, Kendall Jenner, Khloe Kardashian, Kourtney Kardashian, Cara Delevingne, Gigi Hadid and Lebron James. Hmmmm, are these celeb’s being sneaky or are they just being smart?